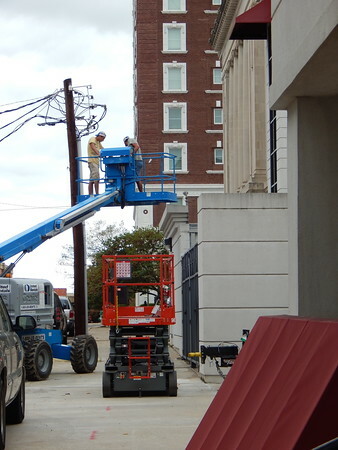 Clifton Carter and Clifton Carter Jr. of Native American Roofing raise a cherry picker toward an awning on the Muskogee County parking garage. The 64 awnings on the County Services Building and Courthouse are being replaced. According to the Muskogee County Purchasing Department, the new blue awnings cost a total of $34,617.